Dave calls me over during class. We are working on a write up for a recent lab. “Ms. N, is this right?” he asks. “What does the question ask?” I respond. This type of exchange occurs daily in my high school chemistry classroom. When I decided to teach science I wanted to make science accessible to all students and promote science literacy, which includes critical thinking, analysis of data, and drawing conclusions based on data. My students’ apparent fixation on getting the “right” answer is not conducive to developing these skills because the inquiry usually stops once the answer is obtained. For the past six months I have been student teaching at an IB magnet school. The majority of the students are bussed in from urban areas. Over half are English language learners or reclassified English proficient. At this school there is only one type of chemistry class (no honors, advanced, or IB classes) so my classes have students at all levels of achievement. From GATE students to ELLs to special ed students to special ed ELL students, the range of needs in my classes are extremely diverse. While I have no doubt that my students are willing and capable of thinking like scientists, I have observed that the school culture places a strong emphasis on doing things "right," so naturally the students respond by seeking the "right" answer. So how can I get my students to think more deeply about their science learning? Clearly I need to change how I asked students to display their knowledge. The worksheets, packets, and convergent questions associated with lab "analysis" that have been used by the chemistry department are not effective in getting students motivated, deepening their learning, or even accurately assessing what they have learned. During my time at this school I have observed students doing whatever it takes to get the answers and credit for assignments, even if it means copying their peers. Rather than being motivated to complete their own work and showing what they know, I get word-for-word the exact same responses on 12 different worksheets/labs/packets. There appears to be a marked lack of intrinsic motivation and my students have difficulty making meaningful connections between what they learn in the classroom and its application, and sometimes may not be learning at all! Rather than putting the pieces of what they learn together and seeing the larger picture, their learning appears to be compartmentalized and their expression of knowledge limited to isolated questions in an isolated classroom. They don’t appear to recognize the importance of science and how it pervades daily life. To test the validity of my initial observations, I implemented several systematic needs assessments to determine how I could better serve my students. There were a few questions that guided my needs assessments: what happens when I give them a more open ended question; what do the students want; and how do my students perceive science learning? As an initial needs assessment I asked my students to express one thing they learned that day without writing it in a sentence. The primary motivation behind this assessment was to see my students’ response. Would they struggle in the absence of a “right” answer? Would they be able to respond? What did they take away from the lesson? Their reaction in the classroom and their responses to the prompt gave me insight into the types of scaffolding my students might need when asked to express their knowledge without a pointed question as well as what they believe to be the important points of the lesson. The day the needs assessment was implemented we designed an experiment where the students tested the effectiveness of various antacids. To do this we reviewed independent, dependent, and controlled variables; reviewed neutralization reactions between acids and bases; and explored how antacids could be used to neutralize stomach acid. Then I did an inventory walk through with the students, showing them what materials were available for them to use in their experiment. At the end of the class period the students were given the following prompt: “Write one thing you learned today without writing it as a sentence or bullet points.” They chose what new knowledge to share and how to share it without a direct question to respond to. There were several reactions when I first read the prompt. Initially, a chorus of “What do you mean?” and “What are we supposed to put?” This was not entirely unexpected based on the previously described culture of “Is this right?” I responded by letting the students know that they could put anything they learned, as long as they didn’t just write it, and to “Be creative.” Some students were excited to draw. I noticed that students sitting next to each other tended to draw the same pictures. When I complimented one student on her creative way of writing “I learned to test the pH of the medicine,” the girl next to her erased her response and drew the exact same thing (left). In general, the students appeared uncomfortable with the assignment but after some reassurance that they could choose what they wanted to share and they could be creative, a lot of the students became very focused on the assignment. After the initial uncertainty, the students actually seemed to lean on me less for confirmation than they usually do. Out of 60 responses, 9 were poems, 3 wrote explanations, and the rest were drawings. There were four types of responses with representative examples shown below: (1) Knowledge: Some students simply submitted drawings of antacids and pH probes which did little to demonstrate what they knew about them (~23% of student responses); (2) Comprehension: Other students drew pictures or write poems defining the three variables we discussed or neutralization reactions (~45% of student responses); (3) Application: Some students depicted the experiment they designed in class (~18% of student responses); (4) The biggest surprise were students that made connections to daily life (~12% of student responses). Since they had learned about antacids, and it was National Pancake Day at IHOP, students related indigestion from IHOP to the use of antacids. Another noted that the Sour Patch Kids must be acidic because a property of acids is sour taste. Although this initial prompt was just a short end-of-the-period informal response, it provided an interesting window into my students' understanding and the role of assessment. Overall I think giving the students a choice in expressing what they learned provided interesting information about my students. I saw students make deeper connections between what they learned and their daily life, something that I didn’t see before. I also noticed that students who have generally lower achievement were making these connections whereas high achieving students struggled a bit more with this task and were the ones submitting simple drawings. From this needs assessment I determined that allowing students to choose how they display their knowledge gives me better insight into how they are thinking as individuals. I also determined that having open-ended questions may be challenging to my students who have been so firmly indoctrinated into the culture of "right" answers. I need to determine what scaffolding my students will need as I introduce these open-ended assessments. As a second needs assessment I have a quick end of class discussion with my students asking them what they liked about the class and what should be changed. They indicated that they like the way content is delivered (short 10 minute lectures with scaffolded note taking). They also mentioned that their favorite part of the class was relating the concept of pH to real life. We designed a lab experiment where we measured the pH of different antacids to determine which was the most effective. They enjoyed the fact that they were able to use chemistry to draw conclusions about a real life situation, in this case what antacid is most effective. From this discussion I determined that my students would like to make connections between what they are learning in class and their life outside the classroom. When they are given the types of prescriptive assignments that have been characteristic of this class, there is little room for them to make relevant connections to their lives. My students like to make these connections and it may be beneficial for them to come up with questions about the physical world for them to answer through their knowledge of chemistry. Allowing my students to choose topics that they find relevant to their lives could change the way they approach the assignments in the class, hopefully seeking out answers because they want to rather than to get the right answer. One of the things I would like to do with my students is some sort of project assessment. I believe that the current assessment structure of getting points for completing worksheets and packets is doing a poor job of facilitating learning. Before I got my students started on a project, I wanted to get a sense for where my students were at in their thoughts and perceptions of my chemistry class. To “take the temperature” of the class I administered the Pre-Project Assessment survey (right) to 50 of my students that were present. The results of this survey were quite surprising. "In chemistry class it is most important to…"
Getting a good grade was the clear front-runner for my students and getting the right answer was dead last in importance to my students. This fascinated me because, from what I observed, getting the right answer seemed to be a top priority for my students. It is possible that the right/wrong mentality is more linked to grades than just being right for the sake of being right. I also included a few agree/disagree questions to evaluate my students’ perceptions on the nature of science, the relevance of science, and whether they enjoyed learning about science. The results are summarized below. 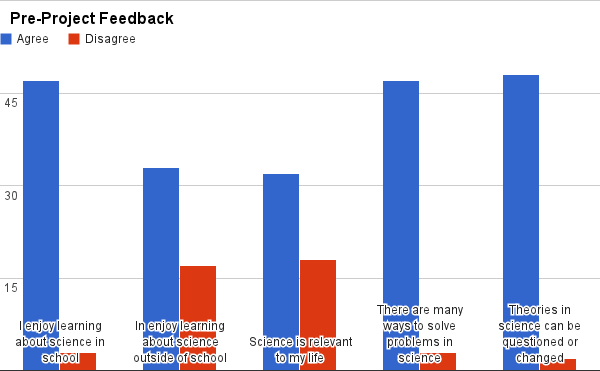 About two thirds of my students believed that science was relevant to their life. I had hopes that this project where they were able to choose a topic relevant to them would increase the number of students believing that science is relevant. Overall, my students perceptions about the nature of science were spot on. The majority of my students agreed with the statements “There are many ways to solve problems in science” and “Theories in science can be questioned or changed.” These statements captured the non-authoritative and ever changing nature of science and, from my students’ responses, it appeared that they were aware of these aspects of the nature of science. This somewhat surprised me. Based on what I had seen throughout the year I didn’t think my students would have such a solid grasp on the nature of science, especially because of their focus on right and wrong answers. Nearly half of my students thought that worksheets and packets were the best way to show their knowledge while a measly 6% thought that tests were a good assessment of their knowledge. In a follow up question, my students were asked to explain why they thought this was the best way. There were two general responses from the students who preferred worksheets and packets. My students either gave an uninformative answer, just restating that they thought it was the best way without any reason or they indicated it was because it contained their notes and was the easiest. I found it really interesting that my students thought turning in notes was a good way to show their knowledge because it really only shows how well they can copy notes, not necessarily if they understand what was written. Through my action research I hope to progress my students perceptions of what it means to show their science learning. In my first needs assessment I looked at what would happen when my students were given an open ended question and a choice of how to answer the question creatively. I found high levels of creativity, less copying, and deeper thinking when students were given this choice as well as some discomfort because there was no right answer. I am curious to explore further what happens when students can express themselves in more creative ways than a worksheet or an exam. In my second needs assessment I asked my students for their input on how the class should be run. They responded that they would like to see more relevance to their own lives. Each student is unique and the things that are relevant to each students' life may be different so it would be useful for students to decide on something relevant to them to study in the context of chemistry. What happens when I give students in a high school chemistry class a choice of how to demonstrate their conceptual understanding? What supports or scaffolds will my students need as I gradually release responsibility to them to create their own form of assessment? How does having choice in assignments impact students' motivation and engagement with the content? By exploring these questions in my classroom I hope to learn more about my students: what they are capable of, how they perceive and connect with science, and what they do when there isn’t a “right” answer.